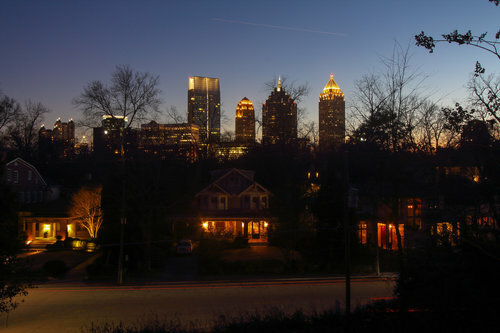 Time lapse photo at twilight of downtown Atlanta and residential neighborhood in the winter. Metro Atlanta’s top-selling county saw more than 1,220 sales last month, while in two other top counties, sales skyrockets 20-plus percent. Our chart below ranks the top-selling housing markets in Metro Atlanta in September, according to research from GAMLS. In addition to home sales, we have also noted the counties’ median sales price, along with how sales and prices have changed from the previous year. Although ARA found that Metro Atlanta home sales declined somewhat in September, GAMLS reported robust increases in specific counties, including 20-plus percent upticks in Henry and Paulding and similarly strong jumps in Gwinnett and Forsyth. Meanwhile, price growth was relatively soft in the counties. Along with marginal increases in Cobb, Cherokee and Henry, prices actually fell in Fulton, DeKalb and Fayette. There were interesting contrasts between sales and prices. While some counties, such as Cobb and DeKalb, matched soft home sales with weak price growth, others saw head-scratching mismatches – in Coweta, for instance, a 17.58-percent sales decline matched a 9.83-percent price increase.